An updated version of this tutorial is available here using the latest version of Visual Studio. 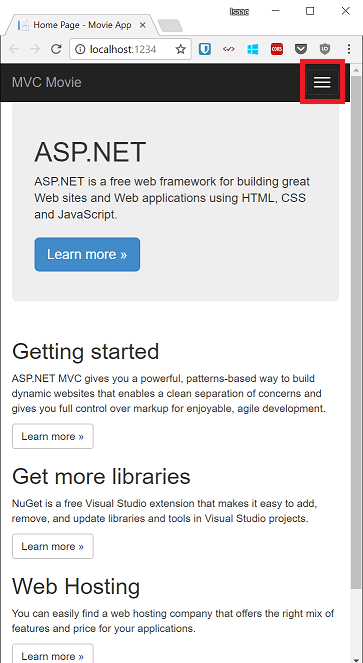 The new tutorial uses ASP.NET Core MVC, which provides many improvements over this tutorial. Is the preferred approach for new application development. 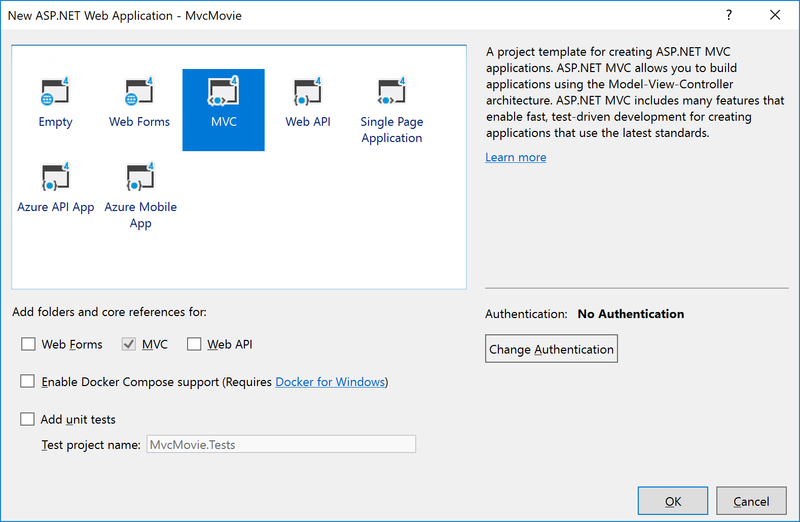 This tutorial teaches you the basics of building an ASP.NET MVC 5 web app using Visual Studio 2017. The final source code for the tutorial is located on GitHub. You can open an Azure account for free - You get credits you can use to try out paid Azure services, and even after they're used up you can keep the account and use free Azure services. You can activate MSDN subscriber benefits - Your MSDN subscription gives you credits every month that you can use for paid Azure services. Start by installing Visual Studio 2017. Then, open Visual Studio. Visual Studio is an IDE, or integrated development environment. Just like you use Microsoft Word to write documents, you'll use an IDE to create applications. In Visual Studio, there's a list along the bottom showing various options available to you. There's also a menu that provides another way to perform tasks in the IDE. For example, instead of selecting New Project on the Start page, you can use the menu bar and select File > New Project. On the Start page, select New Project. 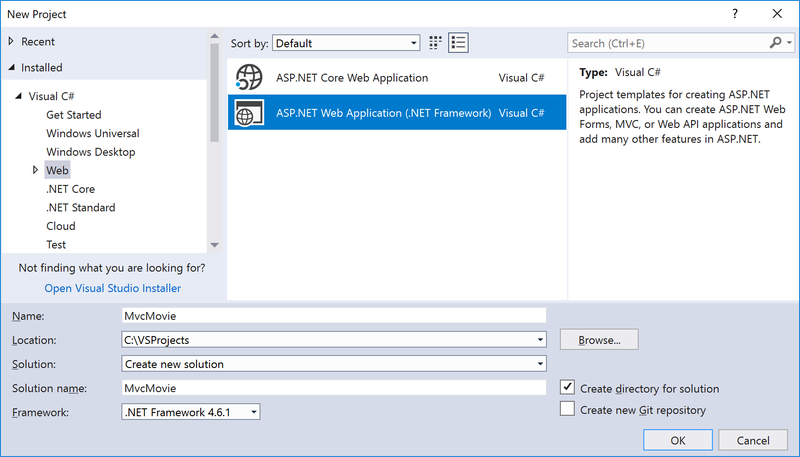 In the New project dialog box, select the Visual C# category on the left, then Web, and then select the ASP.NET Web Application (.NET Framework) project template. Name your project "MvcMovie" and then choose OK. In the New ASP.NET Web Application dialog, choose MVC and then choose OK. 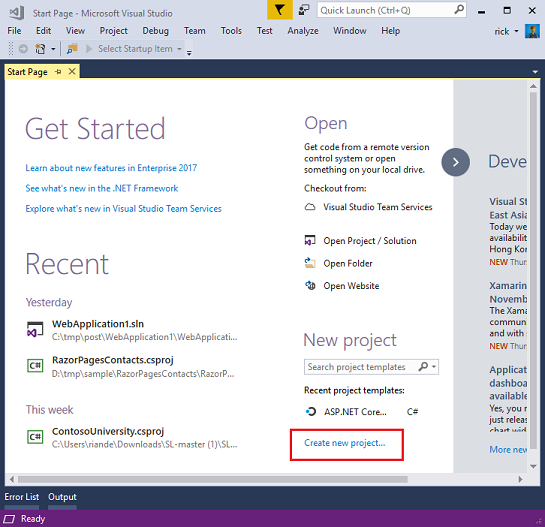 Visual Studio used a default template for the ASP.NET MVC project you just created, so you have a working application right now without doing anything! This is a simple "Hello World!" project, and it's a good place to start your application. Press F5 to start debugging. When you press F5, Visual Studio starts IIS Express and runs your web app. 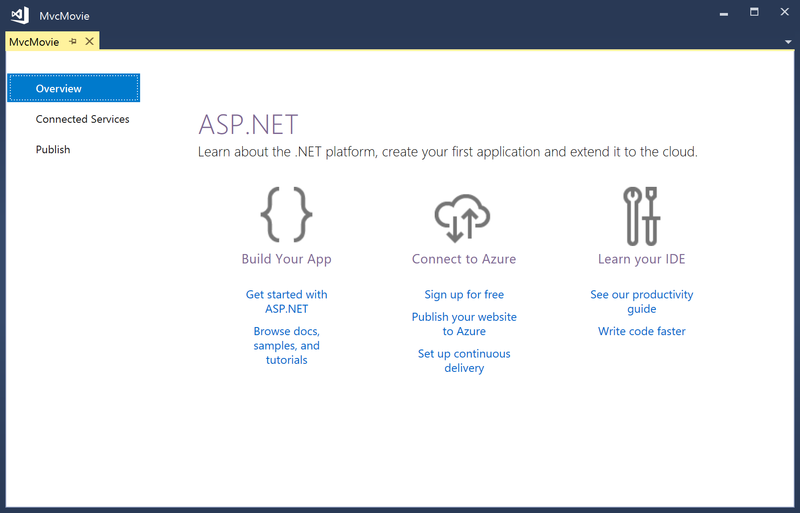 Visual Studio then launches a browser and opens the application's home page. Notice that the address bar of the browser says localhost:port# and not something like example.com. That's because localhost always points to your own local computer, which in this case is running the application you just built. When Visual Studio runs a web project, a random port is used for the web server. In the image below, the port number is 1234. When you run the application, you'll see a different port number. Right out of the box this default template gives you Home, Contact, and About pages. The image below doesn't show the Home, About, and Contact links. Depending on the size of your browser window, you might need to click the navigation icon to see these links. The application also provides support to register and log in. 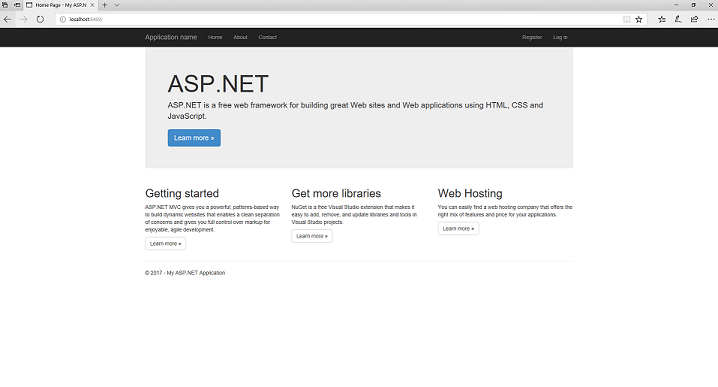 The next step is to change how this application works and learn a little bit about ASP.NET MVC. Close the ASP.NET MVC application and let's change some code. For a list of current tutorials, see MVC recommended articles. Would you like to see the finished site running as a live web app? You can deploy a complete version of the app to your Azure account by simply clicking the following button. Open an Azure account for free - You get credits you can use to try out paid Azure services, and even after they're used up you can keep the account and use free Azure services. Activate Visual Studio subscriber benefits - Your Visual Studio subscription gives you credits every month that you can use for paid Azure services.